Life can certainly throw a lot our way! And, we may even wonder how we can possibly juggle ONE MORE THING. That is . . . until the NEXT THING pops up and tosses itself into the mix. Despite the juggling act, we really are rather well-equipped to handle quite a bit of stress, but that continued, never-ending type of stress that keeps our minds and our bodies in a constant state of alert for long periods of time can sneak up and cause some serious damage. Maybe even so without you even realizing it! You may not be able to eliminate or even decrease your level of responsibilities so easily, but you can make some better choices to counteract the strain. It is possible to escape it, even for a brief period, and give yourself (and your body) a break rather easily. I have some great ideas for you to easily do that, but first, let’s learn a bit more about what that constant type of stress with no let-up can do. But, prepare yourself. . . I am afraid it isn’t good. 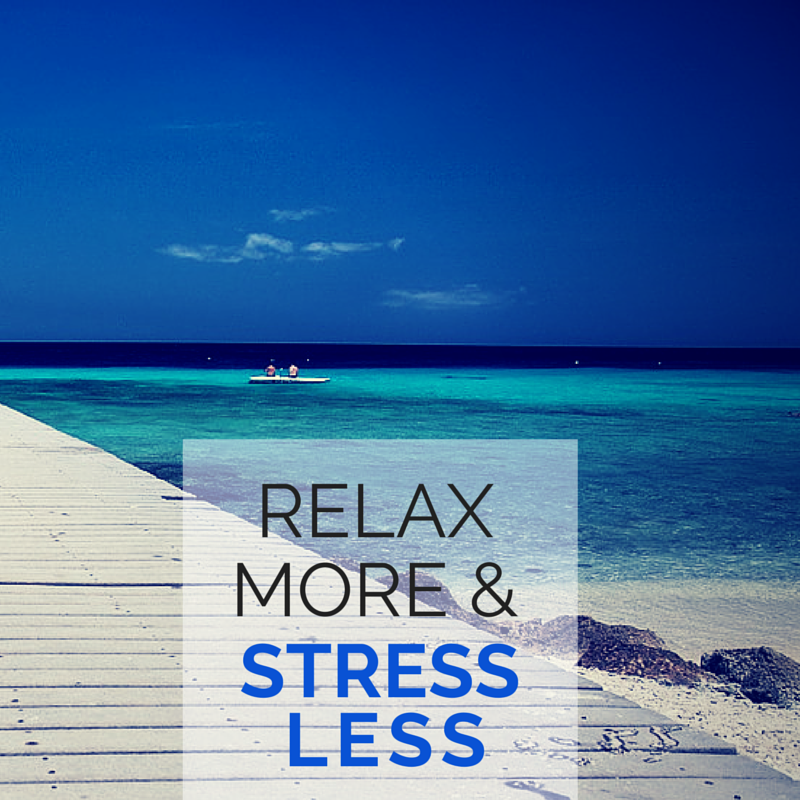 Experiencing stress is natural! We wouldn’t grow or learn without it. And, as I said earlier, we are designed to handle it well. In fact, our bodies respond to stress by releasing hormones, increasing our heart and breathing rates, providing more oxygen to the brain – all giving us the ability to respond well to a demanding situation. Amazing, really! 1. Your mood and relationships can change. Common symptoms of chronic stress include irritability, anxiety, depression, and even social withdrawal. Throw in there some headaches and certainly sleeping difficulties, too. And, some may even respond with overconsumption of alcohol, drug use, overeating or not eating enough. 2. Your heart deserves overtime pay. Stress affects your respiratory and cardiovascular systems making your heart work a whole lot harder. Your blood vessels constrict and can raise your blood pressure. All this can make your heart work too hard for far too long making hypertension, stroke and even a heart attack a greater possibility. 3. Your digestive system provides plenty of uncomfortable signals. That rush of hormones, rapid breathing, and increased heart rate can upset your digestive system, too. Heartburn and acid reflux can result, maybe even ulcers, nausea and the way food moves through your system. Stomach aches are common under stress, too. 4. Pain levels may rise. We tend to tense up when under stress and over time, that can cause headaches, back and shoulder pain which may have some decrease exercise routines further adding to negative effects of chronic stress. 5. You open the door to bugs. Your immune system can weaken from chronic stress leaving the door wide open to viral illnesses like influenza and the common cold. It increases the risk of other diseases and infections, too, and can also increase the time it takes to recover from illness or injury. See? Not good at all! So, scroll on down and find some easy ways to counteract all those negative stresses we seem to experience! This is important for many. Give yourself permission to slow down. Say it out loud if you must. Find one or two relaxing music stations to set in your car and at home or create a soothing playlist or two to quiet your mind and decrease your heartbeat. On your drive home from work, skip the news at least a few times a week and unwind with some great music to revive you. Don’t miss this: Here are some free, easy ways to create playlists quickly. 3. One word syllables can serve you well. Don’t miss this: Here are some great specific tips on this woman’s experience with doing that. Reach for a healthy crunchy food like celery, nuts or a hard apple to take the brunt of your stress. 5. Don’t be afraid of needles. Acupuncture is incredibly relaxing and forces you to chill-out. After all, you don’t want to move and disturb all those needles! 6. Create a cozy nook. Make sure there is a quiet area in your home or yard where you can decompress. Associate that area with a time to relax and listen to nature. Some even create a mediation room and if that appeals to you, go for it! Don’t miss this: How to design your space to reflect you and your needs. 7. Retreat from your routine. Getting away from everyone and everything for a night or weekend or even longer just may be the ticket for you to truly relax and reset a new course. Sign up for a retreat, plan a little vaca and make it an annual escape that you look forward to for yourself. Send phone reminders to yourself to do nothing for 10 minutes and let your mind wander and don’t focus on any problems . . . at all. They will still be there when you get back (sorry!) but you will be refreshed deleting them for a brief respite. Yes, just rest those hard-working peeps and close your eyes. Let the hectic day go black to regain some calm. Don’t miss this: Keep those eyes bright and clear. Sip green tea as it is a source of L-Theanine, a chemical that helps relieve anger and stress. Go ahead and indulge in some dark chocolate to calm the nerves. Cacao levels in chocolate can regulate stress hormones. 12. Try a brief siesta. Now, this can backfire on you so be careful. A brief nap of 20 minutes or less can really revive you. But, longer naps can just make your groggy and disturb your natural sleep patterns. 13. Breathe the right breath. 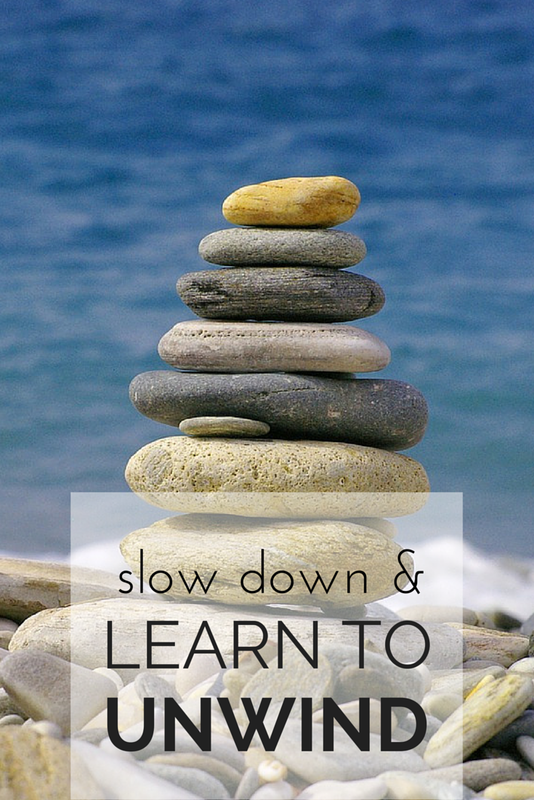 Here is a quick, free way to slow down. Controlled sloooow, deep breaths can help lower heart rate and your blood pressure, too. Your cardiovascular system will thank you. Take those slow breathes a step further and start a meditation or yoga practice, or begin learning tai chi or qigong. There is a reason why those that do this regularly always seem calm. Don’t miss this: A great introduction on how to balance your health with tai chi, meditation, yoga, and qigong. 15. Focus on good times. Bring forth those happy times to the forefront when feeling tense. It can allow you to escape for a bit as well as remind you of what really counts in life and how to get back there. 16. Find the right touch. Massage can do wonders for your body and mind and relationships. Make it a regular thing if it works for you. Don’t miss this: Flip through all the reasons why massage can such be an effective way to de-stress. 17. A little dab will do. Tap a bit of lavender, tea tree, citrus or another essential oil onto your wrist. But, remember always mix essential oils with a carrier oil like coconut oil so that you don’t burn your skin! The scents may activate smell receptors in the nose that can stabilize our emotions in our brain. If you are lucky enough to have a sunny day, step outside and show some appreciation and look to the sun. Bright light can be an effective treatment for people who suffer from depression and can cheer up just about anyone. Talk a walk in that sun too for even greater stress relief. 19. Write it all down. Yup, everything you have to do and/or all your worries – write it down and release it all with no editing. Seeing it on paper can help you get organized in your life and in your mind. Just the act of writing can help create solutions and release emotions, too. No list to destress could go without exercise as a great solution to deplete those stress reactions. A simple walk around the block to a full-out session at the gym can really help you feel and look better too. Sometimes if impatiently waiting, occupying your mind with a game or puzzle can redirect your brain to other efforts and take your mind off the waiting and worrying game. 22. Find your four-legged friends. Time with your pets is an instant stress-reliever. Laugh, snuggle and just enjoy the presence of your fur family. What are friends for? Sharing that’s what. Seek your besties and vent. So, which number is your favorite from the list, or please do add in with your idea to help us all slowdown, unwind and dial it back better to relax more. Try some of these daily habits to make living healthy easier. Here are a few ways to make kitchen clean-up go faster to allow more time for relaxation, too! No- Thank you for taking the time to tell me! Excellent tips here and we certainly think alike. These tips are so easy to put into place which is so important when we are stressed we don't want anything too complicated. A good workout is my go to stress relives. #PinterestGame Sue from Sizzling Towards Sixty. Great point! We do not certainly need complication when our plate is already full! Working out is an excellent choice, Sue. My hat is off to you for that! Love these ideas! This crazy world needs all the reminders it can get. Saw you at Urban Naturale. So glad you came by and found the ideas to reduce stress helpful! Thanks for you kind words, Nancy. So happy to hear you like the blog. I will pop over and check your piece out soon. As a caregiver to an elderly parent who has a chronic illness, stress is now an ever present reality in my life! I have to remember to relieve some of that pressure by employing some of these 23 awesome tips! I love massage, acupuncture and essential oils! Thanks for sharing these gems with us at the Healthy Happy Green Natural Party! I'm pinning and sharing! Deborah, that is so stressful for you and so crucial for you to carve out time to get away to care for yourself, too. My heart goes out to you. Happy to hear it, Jenny! Good tips! working out and cooking are really relaxing to me and really reduce my stress. It's great you have found two ways that work for you, Deborah! Oh – Great add ons, Carol! So happy you added these and thanks so much for adding in. Oh I need to do more of ALL of these!!! Thanks for the reminder to slow down and just ENJOY…life is too rush rush! It is Sarah! We all need to encourage each other to dial it back and don't miss out on the important stuff. I have tried unwinding the past years, but I think that only after letting it all go in July that I found my true path. There are things I can still improve, but I'm better now than months ago. I'm not a rush either. If I can improve one little thing a day, I'm already happy. Beautiful and inspiring post. Thank you really very much for sharing it on #TipTuesday. Rushing is a stressor that we do to ourselves. I know I do and am trying to slow it down as well, Debbie. Excellent point. So glad you came by! Oh yes, LOVE those walks on the beach, Kathleen! Great suggestion. Such great tips! I thing vegging out in front of crappy TV is one of my favorites. I also make sure I give myself 30 minutes of doing nothing after I put my son to bed just to unwind. So smart, Morgan! Taking the time after the children are asleep to DO NOTHING for a bit. No guilt and so beneficial. Thanks for adding in here! Good ones, Liz! But, whatever healthy stress-relief we choose, we just need to remind ourselves to make time daily to do it. Even a brief period can really help. Thanks for coming by. That is a great way to reduce stress, Launna. And, that is a lot of miles! Kudos!